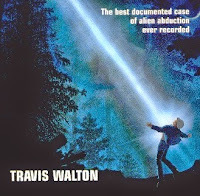 The abduction of Travis Walton is one of the best documented cases of alien abduction ever recorded. However, it is also considered as one of the most debatable cases. The incident happened on Wednesday, November 5, 1975, when Walton was allegedly kidnapped by a UFO. 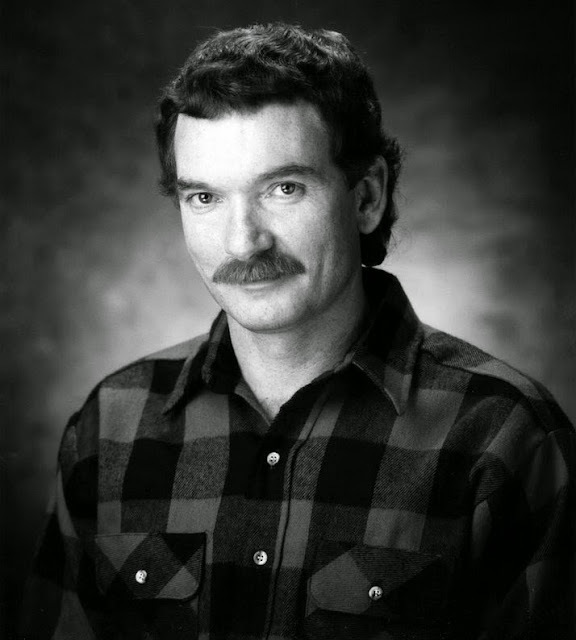 Travis Walton was an American logger who was employed by his friend Mike Rogers, who had nine years contract with the United States Forest Service. 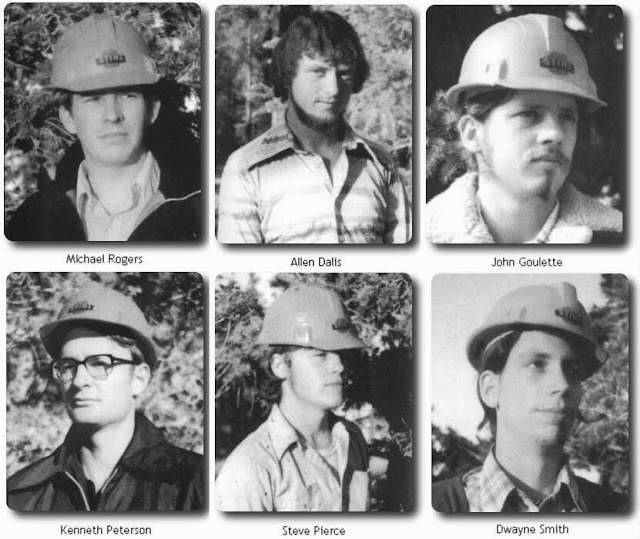 He was working in Apache-Sitgreaves National Forest in Arizona with a logging crew which consisted of Ken Peterson, John Goulette, Steve Pierce, Allen Dallis and Dwayne Smith. They were all residents of Snowflake, Arizona. 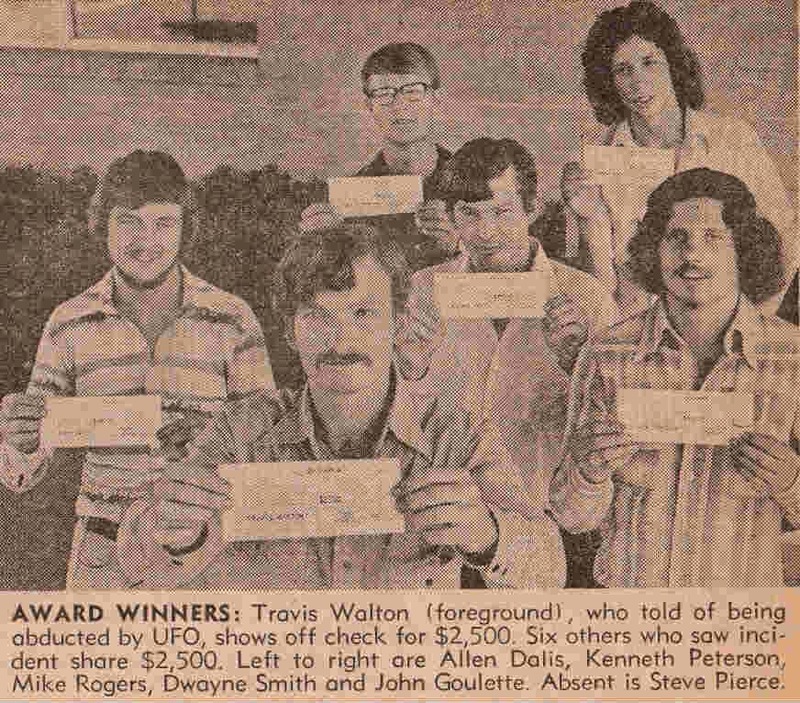 On November 5, 1975, all the seven men (Rogers, Wanton and five other crew members) finished their days work and were returning back to Snowflake in Rogers' pickup truck. Suddenly they spotted a gleaming light behind a hill. 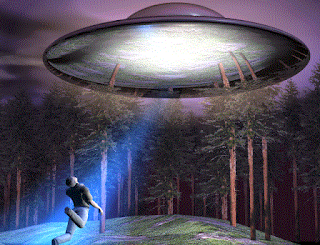 When they approached closer they saw a large luminous flattened disc hovering silently over a pile of logging slash about 15 feet above the ground. The disc was about 8 feet high and 20 feet in diameter. John Goulette asked Rogers to stop the truck. Rogers shut off the engine and they all watched the flying saucer mesmerized by the sight. One silent moment, which felt like eternity and then they were all full of fear. 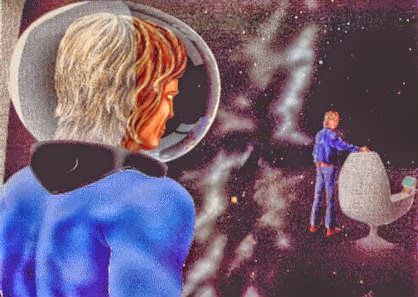 Bewitched by the sight, Walton suddenly jumped of the truck and walked briskly towards the disc to take a closer look to fulfill his curiosity. Alarmed by Walton's sudden action, other crew members called him back (in a loud harsh whisper) but he quietly kept advancing towards the disc in a half crouch. Walton went very close to the disc and was gazing up in awe. Suddenly, the disc sounded like a loud turbine with powerful vibrations and started wobbling from the sides. Walton cautiously moved away from the disc. However, before he could move far away from the disc, a beam of bright blue-green light emerged from the bottom of disc and struck Walton in head and chest. He flung away approximately 10 feet away with his arms and legs extended and landed on the ground on his right shoulder motionless. 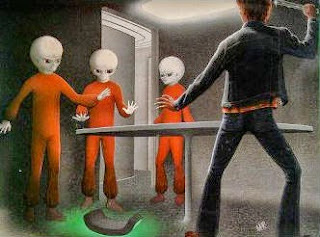 The frightened crew members on seeing the disc moving fled from the scene as fast as they could. In fear of being pursued, Rogers kept hitting boulders and other obstacles on road in his attempt to look behind. After sometime they stopped as Rogers had made a wrong approach to a water bar before Rim Road. They were again surprised by a flash of light which Rogers thought was the disc lifting vertically and moving away towards northeast horizon at a great speed. They subdued their fear, argued among themselves and finally came back to look for Walton. However, they found no signs of Walton or the disc. Neither did they found any signs of a foreign object, nor any hint of disturbed ground or indication of conflict. Ken Peterson then called the police at 7:30 PM from Heber, Arizona, near Snowflake. After reporting the incident to the police, Rogers and Sheriff Coplan went to convey Walton's mother Mary Walton Kellett who lived on a small ranch at Bear Creek, 10 miles from Snowflake. The police sent a search team at the sight but they found no trace of Walton or the UFO. The police was suspicious on the UFO story and felt that it was a cover up for an accident or a homicide. It was suspecting foul play. 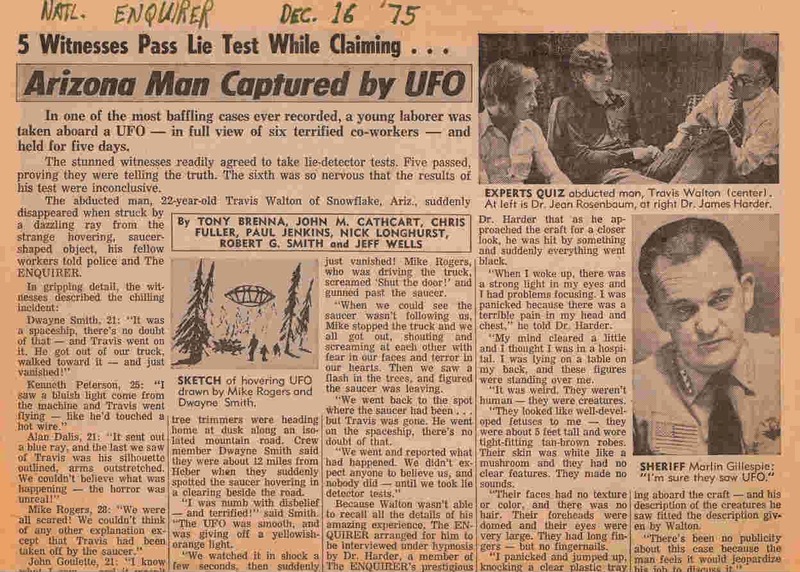 By Saturday, November 8, 1975, Walton's disappearance became an international news. 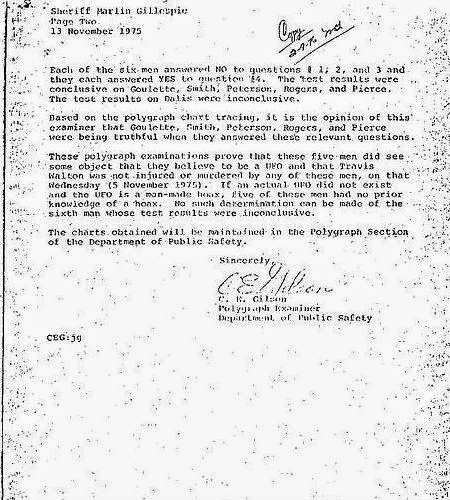 On Monday, November 10, Rogers and his crew were subjected to Polygraph test (lie detection test) which was administered by Cy Gilson, a polygraph examiner of Arizona Department of Public Safety. 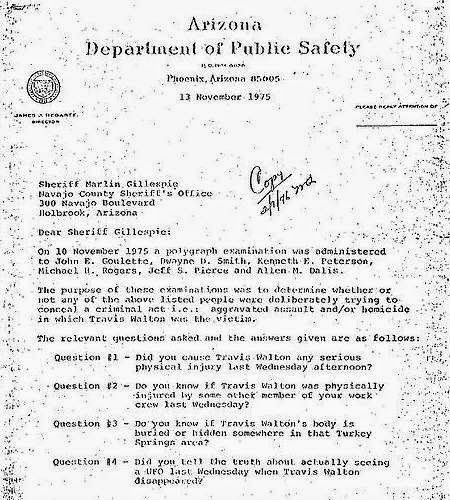 Gilson certified that all the men successfully completed the test and were speaking truth about the incident. Successful outcome of the polygraph test created exponential interest in the case. After 5 days, on Monday, November 10, in midnight, Grant Neft (brother in law of Travis Walton) received a call from Travis Walton from phone booth at the Heber gas station. Initially he felt that it was a prank, but the faint voice of Walton asking for help did not allowed him to take chances. Grant drove out with Duane to find Walton on the floor of the phone booth. Still in the same clothes, Walton was frightened, trembling, bearded, weaker, bewildered, and talking nonsense about strange beings. They took him to his mother's house but he was in a bad condition, most probably in a state of shock. Physically he only had few bruises and abrasion but mentally he was quite unstable and baffled. Walton recalled that after being hit by the beam of light, he woke up in pain. He was thirsty and felt like lying on a table in a hospital, sweating from the moist and humid air. He was still in his work suit and wondered why the nurse did not took his jacket off. When his blurred vision cleared he realized that he was surrounded by three weird creatures who were staring back at him. Their eyes were too big with large iris nearly an inch in diameter with no eye lashes and eye brows. Walton with whatever strength he had regained, pushed one of them away with ease. The humanoid felt soft and spongy. They were under 5 feet tall, thin, fragile, weak and covered with candy looking skin. Their hands were small without nails, while their heads were bald and extraordinarily large for their small bodies. Except the eyes, their whole body looked immature. While trying to defend himself in a panic attack, Walton picked a strange tube to scare them off. The humanoids left the room through an open door. With nobody in sight, Travis tried to escape towards a room with an barren chair through a arched corridor. As he reached closer to the center of the room, the room gradually became darker. Through the wall of the room, small lights began to appear and Walton was able to the perceive stars. He felt scared, and eventually walked to the side of the room. Gradually, the stars started weakening and the surface of the wall, ceiling and floor was visible again. He approached a door and looked up for a control to open it but their was none. Walking back to the chair, he heard an indistinct sound of a door opening. Standing before him was a strong, muscular man over 6 feet tall. Walton asked lots of questions from the man but got no answers. He was taken to a small room through a narrow hallway. Later he left the room through another doorway and saw that the craft he had just exited was much larger (about 60 feet in diameter) in comparison to the craft he had seen in the woods. Walton saw several smaller saucer type discs. 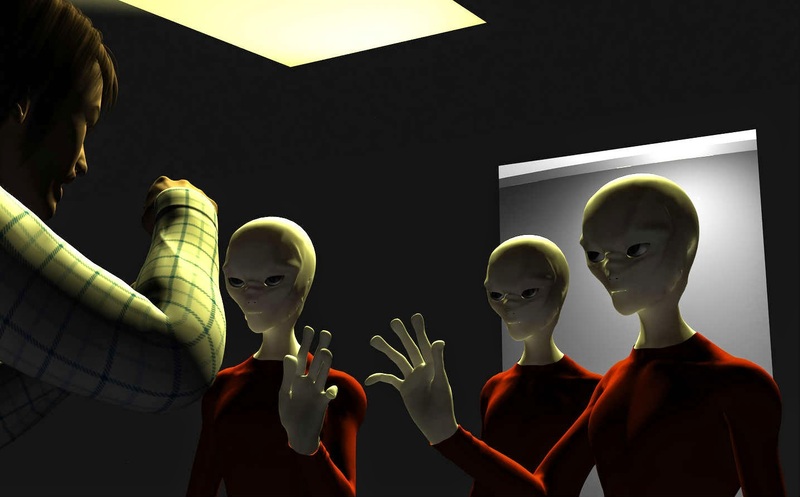 He was then leaded to a white room where he could see three humans – two men and one woman. Walton was taken to a table where he was masked by a golf sized sphere that resembled an oxygen mask by the woman. Walton tried to force it away but suddenly felt weak and passed out. When Walton regained consciousness, he found himself on a cold pavement west of Heber, Arizona. He was lying on his stomach when he woke up from the gust of cold air. He looked up just in time to see a light turn off from a curved luminous hull. He caught a glimpse of white light before blinking off as he raised his head. He was not able to understand if the light turned off or a hatch closed cutting off the light. He then saw a silvery disc floating silently above the road which abruptly shot vertically into the sky which almost instantly lost from sight.